Chronic obstructive pulmonary disease (COPD) is a progressive life ­threatening pulmonary disease, characterized by persistent airflow limitation and chronic inflammation of the airways and the lung. The more exacerbations are recurrent, the more the disease is classified as severe. In 2010, COPD was ranked as the third leading cause of deaths worldwide by World Health Organization (WHO). 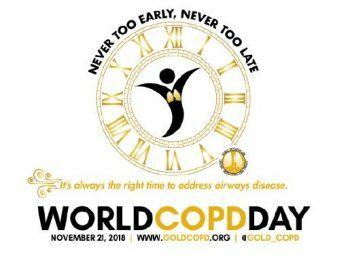 To raise awareness about this major public health concern, World COPD Day is organized by the Global Initiative for Chronic Obstructive Lung Disease (GOLD) on November 21th 2018 in collaboration with health care professionals and COPD patient groups. The main risk factor in COPD development is tobacco smoking, it is to note that ex-smokers can be also affected. Indoor and outdoor air pollution exposure is also another important factor of COPD. An early diagnosis of the disease is necessary to allow a better management by healthcare professional and limit its development.